When there was news about a newer variant of the Brio being launched, everybody got up hoping it's going to be a diesel variant. It's not the diesel though but an automatic transmission version. Honda has however confirmed that there will be a diesel car in its line-up by next year and it will be a sedan based on the Brio. Back to the automatic then, today for somebody looking out for an affordable automatic hatchback there are just two cars to choose from, the Hyundai i10 and Maruti's A-Star. The Brio is then a welcome addition. The engine is the same 1.2-litre i-VTEC unit that produces 88PS at 6000rpm and 109Nm of max torque at 4500rpm. It's definitely one of the most rev happy engines in a hatchback, the manual transmission variant is in fact the quickest accelerating car in its segment. This same engine is mated to a 5-speed torque convertor (first in segment) that is similar to the one found in the Honda City. There are no paddles, but the transmission other than the regular D mode also features three more driving modes  D3 - The gearbox shifts only between 1st and 2nd gear, 2  stays in 2nd gear only and 1  gearbox doesn't shift beyond 1st gear. We drove the car in Delhi's traffic and fast expressways. In town, the car is easy to drive as there is hardly any transmission lag, bumper to bumper driving and creeping ahead is effortless. 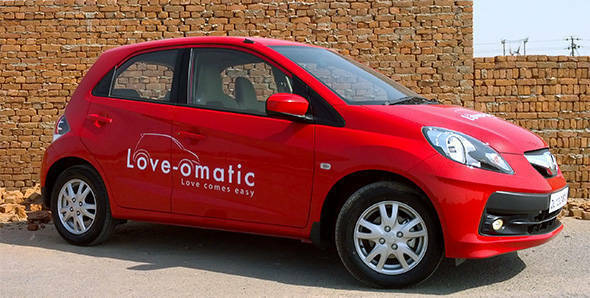 This combined with the Brio's compact dimensions makes it ideal for urban commuting. The transmission is quick to detect change in throttle inputs and drops gears accordingly. This comes in handy especially while overtaking. Out on the highway, the car cruises at speeds above 120kmph with ease. However one needs to hold a steady throttle. At times the car would unnecessarily drop a gear resulting in more fuel being consumed as engine speed increases. The gears shift smoothly and the car feels as fast as the Brio MT, it even went on to max out at 140kmph. We tested the car's performance too, the 0-100kmph sprint comes up in 17.1 seconds (4.25 seconds slower to the manual). This is a respectable figure considering the car features a conventional torque convertor. At launch, the car tends to take a while before the engine starts to pick up revs. If not, the car could have been even quicker. We weren't able to test the car's fuel efficiency but the ARAI claimed figure is 16.5kmpl (2.9kmpl lesser than the manual). The car will be available in S(O) and V variants. It will feature ABS as standard while the top end V variant will even feature dual airbags. Honda has launched the Brio automatic in India in two trims  S(O) at Rs 5.74 lakh and V at Rs 5.99 lakh ex-Delhi, approximately Rs 60,000 more than the equivalent manual trim, making it more affordable than the Hyundai i10 auto.